This thread is to discuss injuries to players for the 2019 season. Hopefully we have some better luck than the previous few seasons. Post all known injuries and news. Note: Mods, please pin thread. Not much news has come out over summer. JJ had hip surgery and is now recovering. Good news so far, can we skip the preseason competition? 2016 Premiers: The Western Bulldogs! What a final series, what a day, what a team, what a coach! I will tell you, the greatest premiership in the history of the AFL. Western Bulldogs draftee Bailey Smith is hopeful a long stint on the sidelines with Achilles issues won't hinder his chances for an early season AFL debut. The midfielder was selected at pick No.7 last year by the Dogs despite missing the end part of the season with Achilles issues. The injury also saw him ruled out for the NAB AFL Draft Combine and has meant the former Sandringham Dragon has had to watch most of the Dogs' pre-season from the sidelines. Smith, who turned 18 in December, said it had been a challenge to observe since arriving at Whitten Oval. "Towards the end of the month or in early February I'll be in full training. It's frustrating. It's been a pain and been pretty lonely at times doing my rehab," Smith told AFL.com.au. Smith is intent on making sure he is ready to go when that time comes. Bike and swimming sessions away from the main group have him fit and fresh, and says his aim remains to don the Dogs' colours early in the season. Western Bulldogs midfielder Lukas Webb has been given the all-clear following a neck injury he sustained last year. 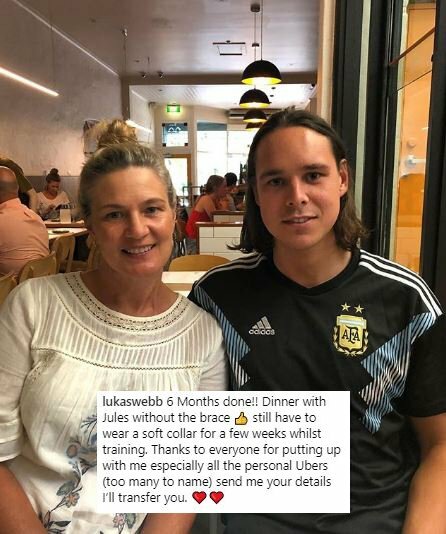 Webb was placed in a brace after he sustained a compression injury in his neck while playing in the VFL in July last year. Scans last week revealed the injury had fully healed, paving the way for him to step up his training in preparation for the 2019 season. “It’s really exciting for Lukas, after being in the hard collar for the last six months,” said Bulldogs’ Medical Services Manager Chris Bell. The Bulldogs will take a more conservative approach with Tom Boyd, as he continues his recovery from a back injury. “Tom has continued to suffer some lower back symptoms from the injury that ended his 2018 season,” Bell said. “He’s got some really good continuity in his running under his belts, but he’s unable to return back to footy loads. The Dogs’ top pick in the 2018 NAB AFL Draft, Bailey Smith, is almost ready to integrate into the full training group, after spending the first few months of his AFL journey in the rehab group. “In his 2018 TAC Cup year Bailey had a really chronic achilles tendon injury,” Bell said. “Since coming into our program he’s been in rehab, but he’s progressed really well and has been very diligent with his program. So, Boyd's back injury dates back to at least early July meaning it's been over 6months now and he's still unable to do much more than basic running. Obviously the break from after Rd 18 to the end of the off season (4mths) wasn't enough to fix the problem. Doesn't bode well for his chances of being able to play freely any time soon. Well one area there is no doubt, our medical team are world class in communicating a conservative approach to injury management. Last edited by Doc26; 22-01-2019 at 01:35 PM. It's a bad sign. I'm really curious to know if it's disc related and what we have done to manage it. I'd like to see him have a good season but it's hard to see that happening if he can't really do the work. It's a long time to be managing the injury as appears to be the case. Having known this was a possibility prior to the end of last season, I am very surprised we did not use the ensuing trade & FA period to address this risk. With English, Trengove and Schache all having had injuries throughout the course of last year (in addition to Boyd's issues) it doesn't look like the most injury resilient ruck corp. What are the odds they all stay healthy this season? It all points to the untried Sweet a distinct chance to see game time at some stage. As for Tom's future, I really hope this doesn't cruel his 2019, but it doesn't look good. It will further place pressure and scrutiny on him going forward. Well one area there is no doubt, our medical team our world class in communicating a conservative approach to injury management. Hoping Tom can 'tick all the boxes' shortly. It was always going to happen wasn't it. Backs however are very difficult to troubleshoot. Can be so many factors. Conservatively, wouldn't want him over-exerting during said box ticking exercise!